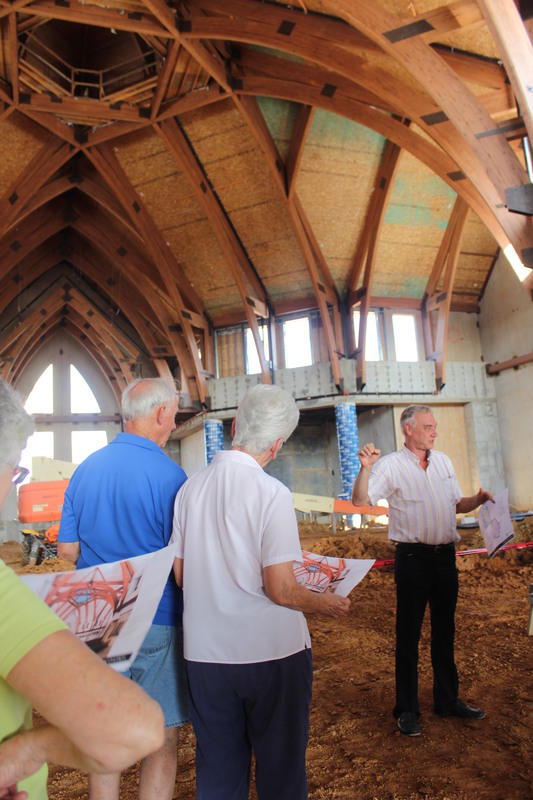 Mike Wise, Office Administrator for St. Jude Catholic Church, led a group of parishioners through the new multi-million dollar church campus in north Bossier Monday evening. This was the first time church members were allowed in the construction site to see the project. 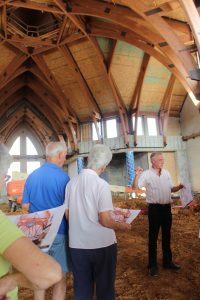 Members of St. Jude Catholic Church stood in awe as they gazed up at the cathedral ceiling of the church they will eventually call home. While some pointed out each little detail, others stood speechless and in somewhat disbelief at the magnificence of the multi-million dollar project. Don and Judy Arceneaux were among the firsts to enter the construction site Monday afternoon. The couple had few words to explain how excited they were, but had plenty to say about how blessed their church family of more than 30 years is to call such a place home. Thomas described the new church as traditional, but encased in a modern shell. The new campus, located just north of Bossier City on Palmetto Road, spans 39,400 sq. ft. and houses all areas of the church under a single roof. The church building itself is 18,200 sq. ft. and includes seating for more than 700 people. The pews will be positioned in a way that will extend them outward and circular around the altar instead of a traditional, straight line set up. There’s a daily mass and reservation chapel, located in a space that can also serve as an overflow area for special services, which seats 50 worshippers. An 80 ft. bell tower and reflecting pond welcomes parishioners and guests onto the new campus. Around the building will be various panes of stained glass windows, which are visible from exterior and interior of the buildings. There will also be an education building for youth groups and nursery age children, administrative offices that include a large conference room and reception area, a 1,400 sq. ft. commercial kitchen and a 5,060 sq. ft. Family Life Center, which will serve as a place for the church and community to gather for various occasions and holidays. Jane Kittler was very excited about seeing where the new industrial kitchen, an area of the church that has the Ladies Guild anxiously waiting to cook their first meal, would be going. Although construction began only a few short months ago, the new campus has been a long time coming. It all began years ago with the desire to build a Family Life Center that would not only benefit the members of their church, but one for the parish to use. However, that kind of project was not realistic on their current 24 acre home on Viking Drive. Land and construction restrictions continued to limit their growth, which happens to be the second-largest parish in the Diocese. In 2007, a committee assembled to lay out and address their needs. It was decided after much discussion that they would leave their 24 acres behind and search for a new place to build their church. Another year passed before they found home. A local family came forward and donated 20 acres of land on the Palmetto Road extension of Airline Drive (about 5.6 miles north of St. Jude’s present location) to build a new church campus. The Diocese accepted the donation, appraised at approximately $1 million, in late 2008. The Liturgical Commission of the Diocese approved St. Jude’s concept and design as being “compatible with liturgical guidelines and with the more general needs of a dynamic contemporary parish” in August 2011. Thomas said the campus is designed for expansion as they see needed. He added that they one day hope to construct a school adjacent to the church. St. Jude’s new campus is on schedule to open in the spring of 2014. Thomas said there’s a chance the congregation could potentially have their first Easter service in their new home if all goes according to plan.